Claire Booth was a successful but stressed-out market research entrepreneur and executive suffering from what she calls "achiever fever"--constant striving coupled with chronic feelings of inadequacy. Sick and tired of feeling miserable, self-help skeptic Booth decides to try anything that might bring relief, from mindfulness to martial arts, from spending ten days in silence to "smiling" at her spleen. At first, Booth is fearful that slowing down and softening up will mean losing her professional edge. Instead, she discovers a more joyful and purposeful life, one that also turns out to be good for business. 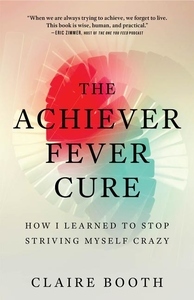 Bolstered by her own survey of other high-achieving professionals, The Achiever Fever Cure is a frank, funny, and inspiring story of Booth's road to recovery. Recognize any of these symptoms? This book offers inspiration to help you put your own achiever fever on ice.